Floors are not exactly conversation material. 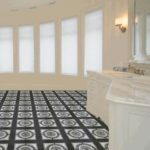 When one designs or enters a room, the floor isn’t exactly the first thing that will draw attention. In a commercial setting, it should be. In fact, the way the floor looks may just be the strategy you need to entice new customers. There are various options out there. Make sure that you choose the right commercial floor solution that best suits your business. Concrete stains have always been a favorite colored concrete material. It comes in two types: acid and water-based. Acid stain comes in a range of semi-translucent earthy colors and it creates unique, random mottled effects similar to natural stone. Water-based, on the other hand, is available in a range of opaque colors, from pastel to earth tones. 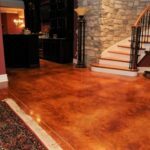 A stained concrete floor can be used in any type of industry. If you want an outdoor-like setting inside your establishment, artificial grass will definitely deliver. It looks so realistic and feels so soft under your feet that anyone would think it is the real thing. Kids and pets would love it. Artificial grass is also very easy to clean and maintain, making it an ideal investment. Glass is not as fragile as it was before. Nowadays, technological developments have been made to make glass more durable. Certain systems have also been created to make it safe in case of accidents. Imagine how magical it would be to walk into a store or restaurant with a floor that glitters and shines. Definitely a treat! 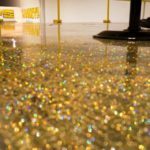 Glitter can be manually installed on the floor then topped off with a layer or you could use an epoxy floor coating with glitter or metallic accents. Wood is cut into jigsaw puzzle shapes and then fit together to create a puzzle floor. 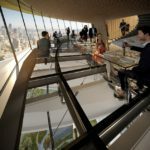 It is definitely an interesting flooring design that will have customers talking for days. 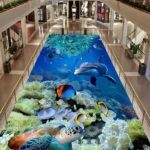 This is gaining popularity as customers are intrigued about walking on a floor that gives an illusion of a hole, empty space, a waterfall, or anything you could imagine. This floor material is something that would work best in luxurious hotels and fine dining restaurants. At a £625,000 price tag per square meter, it better be very durable and absolutely stunning with all its diamonds, mother of pearl, abalone shell, and black onyx ingredients. 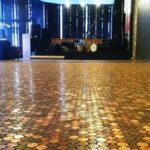 A coin floor is definitely a cool and creative flooring design. Make sure that each coin is bonded really well on the floor so that it won’t be a safety hazard with all those gaps caused by missing or dislodged coins. 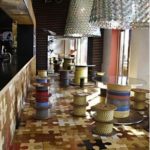 In choosing a creative flooring material for commercial spaces, make sure that it speaks your language, enhances the customer’s experience, and that it fits your company’s budget, both in installation and maintenance.